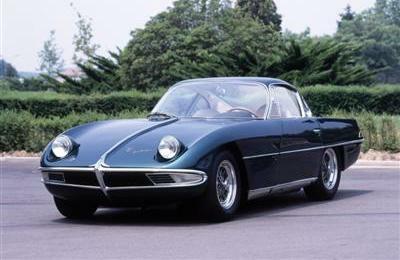 Lamborghini's first model was the 350 GTV of 1963 (above). However, the styling wasn't warmly received and this model gave way to the 350 GT (below) in 1964. 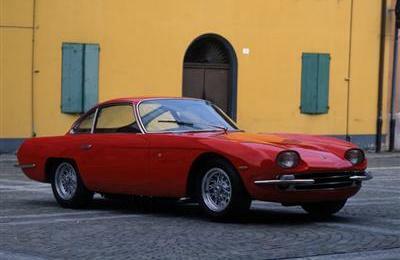 The 350 GT became Lamborghini's first production model (135 units were manufactured). The celebrations to mark the 50th Anniversary of Lamborghini will be conducted in Italy and abroad throughout 2013 culminating in May, during the same week in which, 50 years ago, the Company was incorporated and the inaugural foundation stone was laid at its factory in Sant’Agata Bolognese. The Lamborghini 50th Anniversary Grand Tour, expected to be the biggest Lamborghini rally in history, will run the length of Italy, and will be attended by Lamborghini owners and dealers from all over the world. From 7th-11th May, 2013, more than 1,200 km of Italy’s roads will roar with the thrum of hundreds of Lamborghinis. From the unforgettable historic GTs to the futuristic super cars of today, the cars will arrive from every corner of the globe to parade through numerous Italian cities. On Tuesday, 7th May, the cars will gather in Milan, leaving the next day for Forte dei Marmi. On Thursday, 9th May, they will set off towards Rome, with a evening arrival in the city centre. On Friday, 10th May, the cars will depart towards Bologna, via Orvieto, arriving during the evening. Saturday, 11th May mark the closing day of the celebrations: the cars will head off in procession from Bologna towards Lamborghini’s famous factory in Sant’Agata Bolognese, where participants will visit the historic museum, the production facility, as well as enjoy other Lamborghini experiences. A gala dinner held at the factory will end a thrilling day packed with events and entertainment. At each stop, Lamborghini enthusiasts will be able to see the cars. Founded in 1963, Automobili Lamborghini is headquartered in Sant’Agata Bolognese, in north-eastern Italy. There it manufactures super sports cars. With the introduction of the Aventador LP 700-4, Lamborghini has marked another milestone in the history of luxury super sports cars. With more than 120 dealerships worldwide, Automobili Lamborghini is building on a succession of dynamic and elegant super sports cars including the 350GT, Miura, Espada, Islero, Urraco, Jarama, Silhouette, Countach, Jalpa, LM, Diablo, Murciélago, Reventón Coupé, Reventón Roadster, Gallardo LP 560-4 Coupé and Spyder, Gallardo LP 570-4 Superleggera and the open version LP 570-4 Spyder Performante.